Distributed generation is claimed to provide a better means of following and meeting demand, but do not seem to have been researched in depth. Distributed generation requires a change in the configuration and design parameters of transmission and distribution (T&D) networks. The concept of distributed generation has not been clearly defined, and this results in some uncertainty as to which design philosophy to adopt. The arguments against centralised networks are based largely on the generating plant rather than the T&D network. High cost and long time to build are quoted as impediments to following demand growth closely. In addition long distances between generation and load centres results in high losses and increases the vulnerability of the associated T&D network. Distributed generation is claimed to be cheaper and faster to build, and smaller sized plant should allow incremental or modular growth in the network. According to Prof. Eberhard there is a need to follow growth more closely, and this requires smaller units with much shorter construction times . Projects involving large power stations using new techniques have proven to be characterised by delays in delivery and cost overruns. The same generation capacity could have been provided sooner and at lower cost if smaller standardised power stations had been planned. If this country follows the Neanderthal path it is likely to experience the same problems, with power shortages and oversupplies being the theme of the future . Fig. 1: Extreme case CG network. A T&D network based on distributed generation (DG) should allow greater interconnection of sources, reducing vulnerability. The claims for DG networks are based largely on experience with renewable energy plant, which has proven to have short construction periods and a decreasing cost. There is, however, a move to larger centralised RE plant, which shares the same relatively short construction period, and the possibility of modular construction, which may negate the advantages of the distributed approach. Distributed generation is also commonly called small-scale generation, embedded generation or decentralised generation. It appears that there is no consensus on a precise definition as the concept encompasses many technologies and applications. DG has a serious impact on the design of the network, and adaption of an existing network to accommodate DG may require redesign of the network, as well as incorporating advanced control features in what would otherwise be a simple configuration. The purpose of the transmission or distribution network is not only to feed power to load centres but to control power quality as well, i.e. voltage levels, stability, power factor, etc. The introduction of DG into a network affects all these parameters. From a T&D perspective the difference between centralised and distributed generation is the network configuration used. Future network planning involves answering the question of how a DG network will fit in with the concept of a national grid, and whether it is possible to base the national grid entirely on a distributed configuration. DG networks are claimed to be more resilient than CG, probably because of the possible interconnection of many sources, and the presence of flexible transmission equipment as well as network controls. Proximity of DG sources to loads increases resilience, as power can be provided to the local load centre when the main grid is down. “Distributed generation refers to a variety of technologies that generate electricity at or near where it will be used, such as solar panels and combined heat and power. Distributed generation may serve a single structure, such as a home or business, or it may be part of a microgrid (a smaller grid that is also tied into the larger electricity delivery system), such as at a major industrial facility, a military base, or a large university. When connected to the electric utility’s lower voltage distribution lines, distributed generation can help support delivery of clean, reliable power to additional customers and reduce electricity losses along transmission and distribution lines” . The reality is that the distinction between DG and centralised generation (CG) is not as simple as that given in most of the definitions and is becoming blurred as more smaller plant in introduced at various places in the network. Consider two extreme cases as an example. The substation may be any substation in the network, i.e. a transmission or distribution substation. In the extreme case of a centralised network, generation is concentrated at single centralised point, not associated with load centres, and electricity is fed to load centers via a radial network. See Fig 1. 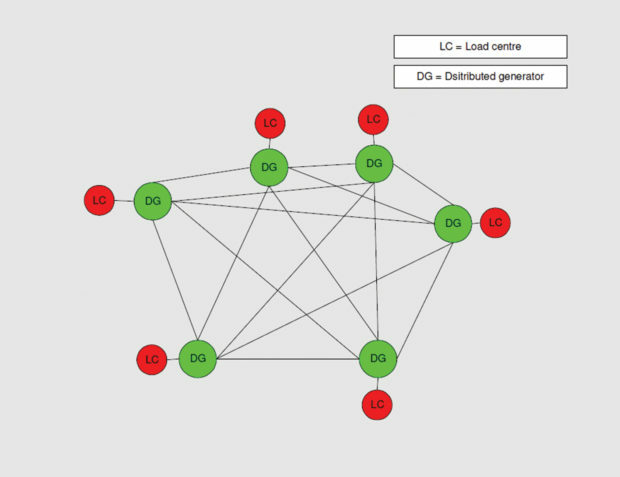 In the extreme distributed network case, generating plant is associated with every load point, and all load centers are interconnected (Fig. 2) the generating plant is intended to supply the load points but with spare capacity to supply other load points in case of need. This extreme case is epitomised by the growth of rooftop solar, i.e. each load centre has its own generator, although the DGs are connected to a grid, and rely on the grid for balancing. The interconnection is essentially on a bus basis rather than a mesh. Distributed generation plant not associated with load centres but connected to the grid behave the same way as concentrated generation. For instance, a number of solar PV farms in the same area will have the same effect as a single concentrated farm. The current network of REIPPP plant in South Africa is effectively a concentrated generation fleet as it connects directly to the radial grid, although connection is via load points (substations). Most networks are a combination of centralised and distributed, with much of the distributed generation being embedded. In South Africa, for example, Koeberg Power Station serves the Western Cape area only and Kelvin serves the city power network. 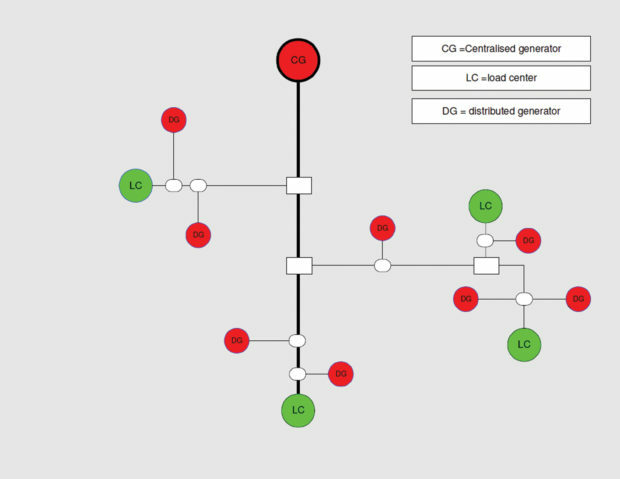 Smaller embedded generating plant such as industrial co-generation increases the distributed nature of the network. Fig. 2: Extreme case DG network. Consideration of the distributed grid as defined makes it clear that the distributed DG network as commonly defined may not fit the theoretical demands of faster construction, closer response to demand, and lower costs. For one the small size of plant and the direct association with loads, leads to a proliferation of small generators, with no provision for diversity, which means over provision, and no economies of scale. In the case where every generator has to meet the maximum demand of the load, over provision takes place, and in the case of renewables, where every generator is producing at maximum simultaneously, the network may not be able to absorb all the power generated. The ideals as stated by several sources appear to refer to a generating source which would serve an area load rather a single load, and take advantage of interconnection to the main grid rather than direct interconnection. Design based on smaller generation plant distributed throughout the national grid, makes more sense as it provides some of the advantages of economy of scale and load diversity, while retaining short build times and reduction of transmission losses. In the South African network, such a system would involve smaller generating plant close to major regional load centres. Fig. 3 illustrates this principle. The creation of renewable energy development zones (REDZ) will lead to the growth of such DG networks, and design needs to take this into account. One of the problems with distributed generation is catering for growth. Does one extend existing plant at the same site, which leads to effective centralised networks, and requires upgrade of the T&D network, or does one add new plant at new sites to the network, which leads to a proliferation of small plant and an inevitable complicated T&D network? The issue of growth in distributed networks has not been adequately considered, and if a growth plan or policy is not followed, serious problems could arise. This is even further complicated when adding DG to an existing network. Current decisions on new DG plant siting are based on resource quality and connectibility to the grid, rather than proximity to load centres, and if this is continued in future, any advantages of DG could be lost, and overtaken by disadvantages of CG plant, i.e. remoteness from loads and losses in the T&D network. This is exacerbated by the variable nature of RE plant, which means that the capacity factor of the T&D networks will be low. Technical issues: distribution networks will have to be reinforced and partly redesigned to cope with new capacities. Besides, they will have to incorporate both control and protection software and hardware to coordinate the distributed generators. Price competitiveness: for a move toward distributed generation to be efficient in terms of both performance and price, distributed generation will have to be used where it is more competitive than centralised generators, i.e. in distribution networks where the retail cost of electricity is high, or in remote areas where transmission costs push the price of centralised power high. In the case of renewable energy generators, selling price is not a consideration as purchase is mandated by national programs. Environmental impact: distributed generation does not necessarily mean clean generation. Indeed, diesel reciprocating engines often used as back-up distributed generators tend to be the worst performers in terms of greenhouse gas emissions. Distributed generation, to be a sustainable alternative paradigm, will thus have to rely on the cleanest technologies or favour efficient uses maximising energy efficiency and reducing emissions such as cogeneration. A study conducted in California showed that distributed generation had the same impact on air quality as centralised generation . In addition DG may result in more complex transmission and distribution networks with an effect on the environment. Interconnection of DGs in the grid impacts on both the sizing of interconnections and protection. The penetration of DG in the distribution network will certainly make the planning and operation of the distribution network more complex [1, 2]. However, that will also offer a great opportunity for enhancement of distribution network utilisation. The advantages of modern measurement, control and management systems should be tested in order to derive full benefit from existing investments and to meet the quality requirements of power supply in the future. The structure and operating principle of the distribution network will move towards a distribution system (active distribution network ) with several active components along the network. Ring operation of the distribution network may also allow improved control and operating principles than today . Fig. 3: Emerging DG network. The worst planning case of radial distribution network is the maximum demand condition which determines the dimensioning of the network. This condition is used to determine the maximum currents and voltage drops in each feeder section. The interconnection of DG in a distribution network causes a voltage rise problem in lightly loaded networks. The easiest way to take the voltage rise problem into account in network planning is to extend the existing planning principle with this new restriction . Maximum demand – minimum production. Minimum demand – maximum production. The simplicity of the worst case planning principle is both the best and the most unsatisfactory feature of this principle. It is considered to meet the requirements of network planning accurately enough and in an appropriate way when the number of DG units is small, relative unit capacity is large, and the production of units is based on the same energy source. These conditions are likely to be met when the alternative grid configuration mention previously is adopted. Under this regime distributed generation would consist of medium sized units all of the same technology. The correlation of power production and load demand is a very critical issue in network planning. The assumptions of the worst case planning principle are less likely to be fulfilled when the number of units is large, the unit capacity is small, e.g. a photovoltaic unit which replaces part of load demand of a house-hold, DG units are equally dispersed in the network, and various energy sources are used. The whole idea is based on the fact that the network transfer capacity may be larger with flexible than with fixed interconnection when network constraints occur occasionally. The fixed interconnection is always available and calculation of interconnection capacity is based on the worst case planning principle. 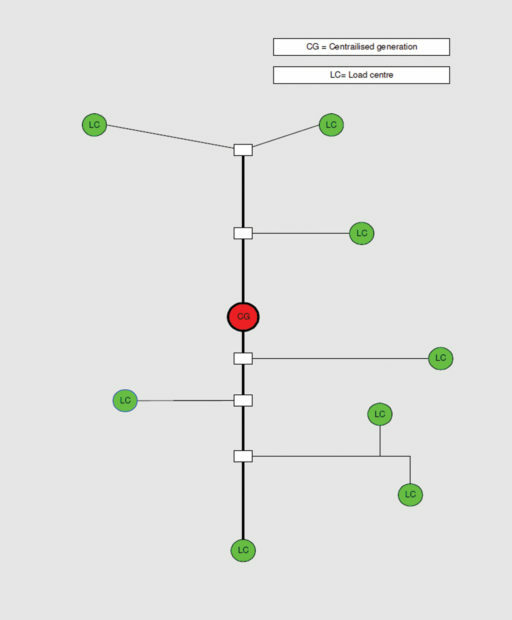 The flexible interconnection expects controllability of DG unit (reactive or active power), but it can utilise the capability of network more precisely. The use of flexible interconnection requires active network management to avoid occasional network constraints. Flexible transmission systems (FACTS) are not often used in distribution networks but may facilitate greater use of DG networks . A DG network is different from a radial grid as power can come from any of the sources and can flow in a bidirectional manner. The flow of power within the DG will depend on several items. The power generated by a DG at the time: This is important with RE sources such as wind and solar, as the output is variable, and in the case of solar PV, can change rapidly. The load at each load point at the time: This does vary depending on the load point. Interconnections will need to be sized to cater for both the maximum potential power flow in both directions, and the average values. This increases the cost of the T&D network. The same applies to grid connected DG, especially where the DG is sited far from the substation. Generation and load diversity need to be taken into account. The normal fault current from the grid connected transformer. Fault current from the interconnected DG sources. This will depend on the state of operation of the device and the fault current capacity of the generator. Fault current from a storage device if installed. Planning and design of protection equipment and systems becomes more complex as the variable generating states and location of the various generators needs to be taken into account. M Rycroft: “Power generation options for South Africa”, Energize, November 2013. S Repo, et al: “Statistical short term planning of distribution network and distributed generation”, 15th PSCC, Liege, 22-26 August 2005. M Carreras-Sospedra, et al: “Central power generation versus distributed generation – an air quality assessment in the South Coast Air Basin of California”, Atmospheric environment 44, 2010. The post Distributed generation: The impact on network design appeared first on EE Publishers.